When envisioning “robotics”, most people either imagine R2-D2 and C-3PO, or something that is meticulously designed and built by a small group of people who do nothing else. Westtown Robotics does not promote those stereotypes. Besides designing a robot to meet FRC®’s challenges each year, the team also engages in activities that fully promote FIRST®: For Inspiration and Recognition of Science and Technology. With exciting outreach activities, the team is determined to spread FIRST®’s message, inspire students and mentors to participate in FRC®, and intensify the passion of people all over the world for science, technology, mathematics and engineering. 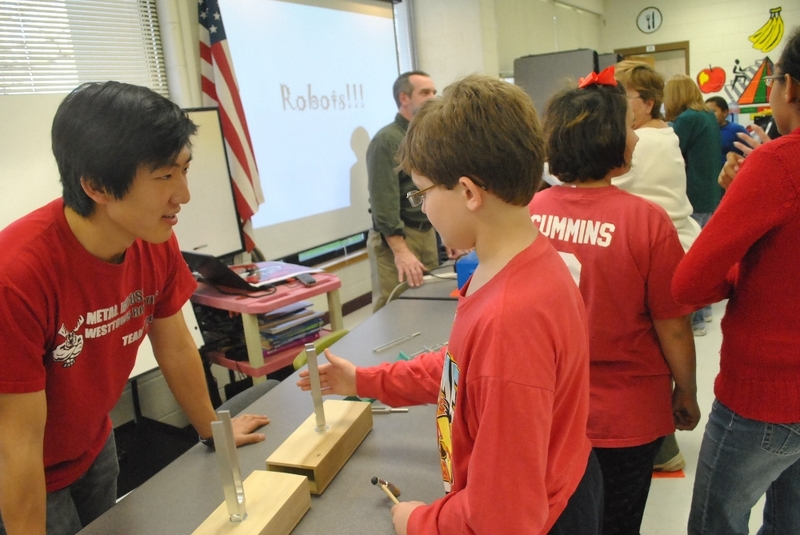 With the goal of encouraging not just Westtown students but also parents to be part of the Westtown Robotics, the team volunteered to give a presentation during a Westtown School Open House, a day when prospective families can take a closer look at the campus. In addition to talking about FIRST® and its various programs to more than 60 middle school students, the team showed off last year’s competition robot in front of the Westtown Upper and Middle school student body to resounding applause. Partially because of these activities, as well as the good name the team has on campus, the Metal Moose has received enormous support from parents, and many students have signed up to join the team for next year. The team’s outreach efforts continue outside of the Westtown School environment. During preseason and postseason, to share our excitement of robotics and ignite the passion for STEM education, the team has demonstrated robotics activities at other nearby schools. This past fall, the Metal Moose spread the vision and message of FIRST® by visiting the Vanguard School and Girard College. The Vanguard School is a K-12 school for students with pervasive learning disabilities – while there the team worked with small groups of students at “science stations” that allowed hands-on experience with safe and exciting science phenomena, and presented our 2013 year robot to the students. Our visit to Girard college was at the invitation of the FLL® competition coordinator for the Girard College event – there we presented the message of FIRST®, the excitement of FRC® and our team’s 2013 robot to hundreds of middle school students gathered for an FLL tournament. Judging from the reaction of parents, students and administrators, Westtown Robotics has done an outstanding job of spreading FIRST®’s message and embracing FIRST®’s mission. The purpose of those visits, as mentioned above, was initially to spread FIRST® message. However, judging from the reaction of parents and students at those schools after the presentation, Westtown Robotics realized that the team has done more than first planned. The visits also inspired the team to become more active in the community, and to encourage and inspire even more students from all over the world to become a part of FIRST®. One of the team’s many missions is to help promote non-profits to the public so that the non-profits could benefit from positive publicity and awareness. One of the non-profit organizations was the Rozalia Project ©. Their missions of helping protect the world by cleaning up the ocean and educating people line up with our team’s goal as well. The team strives to be a sustainable practice, by recycling, reusing, and being careful of how the team disposes of waste. At the 2014 Philadelphia Science Festival the team volunteered people to help run the exhibition of one of their underwater micro-submarines, and educating the public on the dangers of pollution. At the festival our team members quickly learned what the Rozalia Project © was all about and was taught how to pilot a micro-sub. The Rozalia Project © was able to greatly benefit from the extra help and was therefore able to help the oceans of the world. Every year, the team organized field trips to visit local businesses. For example, the trip had the Business, Outreach and Communication Divisions visiting Midlantic, Ltd, in Kennett Square, PA. Midlantic uses its marketing and branding expertise to supply small businesses with fresh marketing strategies and facilitate their growth. Our goal was to meet with the owner to learn more about how his company could help the team with the fulfillment side of a proposed team Web-store. This visit was indeed a rewarding experience for us as not only did we learn about how their business functions, and we also gained valuable information on how they can help us launch and maintain a Web-store (details of which are outlined in the Financial Plan on p.19). Partway through the build season, a group of nine team members were invited to visit Test Products, Inc. in Exton, PA. TPI is a company which specializes in providing nationwide consulting, engineering, evaluation, testing and commissioning services for standby power systems in the telecommunication, utility and financial industries. One of our new mentors works there and made the introduction. As we toured the facility, Phil, a TPI engineer and MIT graduate, showed us TPI’s state-of-the-art battery testing lab, including a high sensitivity infrared camera, as well as their mobile testing rigs. Later, we had an opportunity to sit down with the owner of the company and other engineers and give the Metal Moose fundraising presentation. Happily, the team’s strong presentation convinced TPI to become the Metal Moose’s newest corporate sponsor, and in true FIRST® form, the team reciprocated the favor and invited TPI families to visit the Robo-shack during the final days of build season. Using a 3D printer and imaging software, the students on the Robotics Team designed a fully functional prosthetic replacement for a seven-year-old boy who was born without a hand. They met with him and his mother regularly to try out new iterations of the design. As part of their design and engineering, using a 3-D device, the students made a robotic hand with fingers that can open and close around a lacrosse stick or ski pole. Among other things, the boy said he is confident the hand will improve his trampoline-basketball game. "I can grip better on the trampoline and slam-dunk better," said the boy, a sandy-haired charmer who maneuvered and played with the device as if it were the coolest toy on the planet, during a visit to the 600-acre campus.